A history of war photography – from Vietnam to Iraq and the War of Terror – and how photography has changed war. 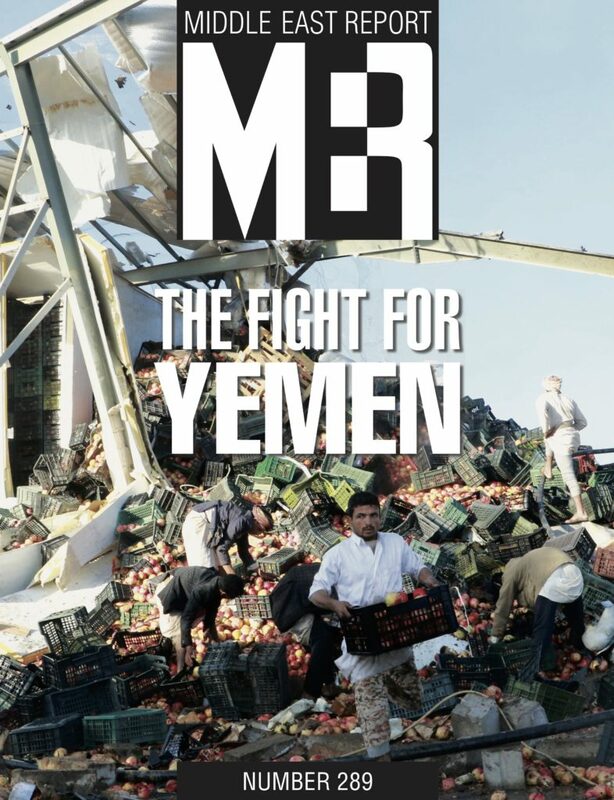 Today we watch wars from afar, swayed by the images that fill our newsfeeds, social media and screens. Since the Vietnam War the way we see conflict through film, photographs, and pixels, has had a powerful impact on the political fortunes of the campaign, and the way that war has been conducted. In this fully-illustrated and passionately argued account of war imagery, Julian Stallabrass tells the story of post-war conflict, how it was recorded, and remembered through its iconic photography. The relationship between war and photograph is constantly in transition, forming new perspectives, provoking new challenges: what is allowed to be seen? How are photographs remembered? Does an image has the power to change political opinion? What influence market economics has upon the way we consume visual media, especially images of war. How new forms of distribution change the image’s potency. 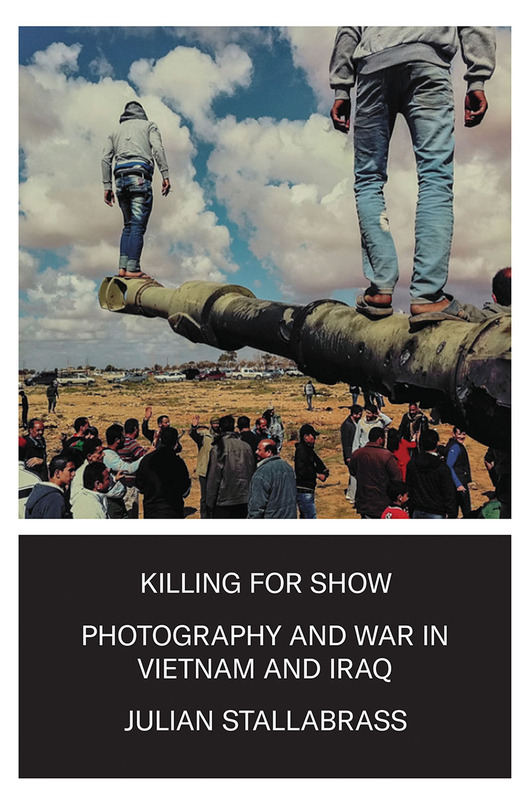 Stallabrass shows how photographs have become a vital weapon in the modern war: as propaganda – from close quarter fighting to the drone’s electronic vision – as well as a witness to the barbarity of events such as the My Lai massacre, the violent suppression of insurgent Fallujah or the atrocities in Abu Ghraib. 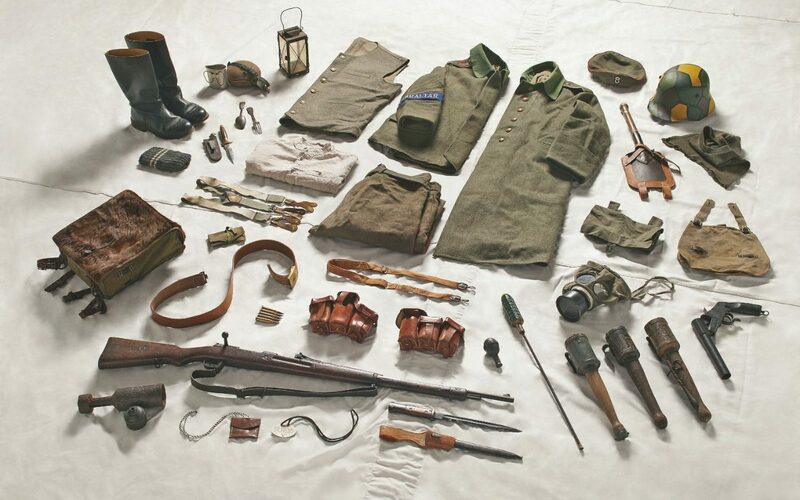 Changes in technology – from shutter speed, use of colour stock, and methods of digital distribution – have also transformed the way photography is used in depicting and even waging accelerated warfare. Through these accounts Stallabrass maps a comprehensive theoretical re-evaluation of the relationship between war, politics and visual culture. Killing for Show is an essential volume in the history of photography. A mammoth 688 pages, packed with images – and, since it’s Verso, astonishingly reasonable priced. 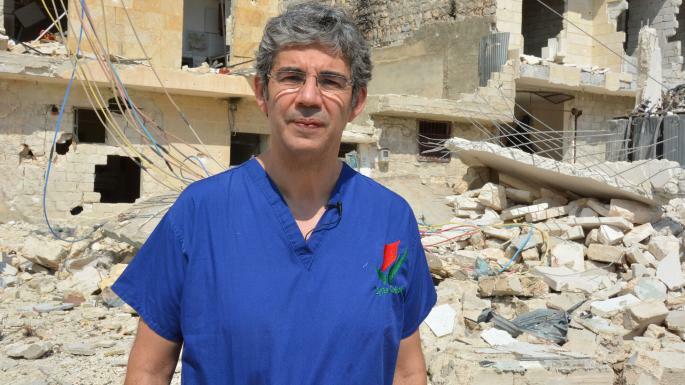 If you’re unfamiliar with David’s extraordinary efforts in Syria, I touch on them – all too briefly – in ‘Death of the Clinic’ here. 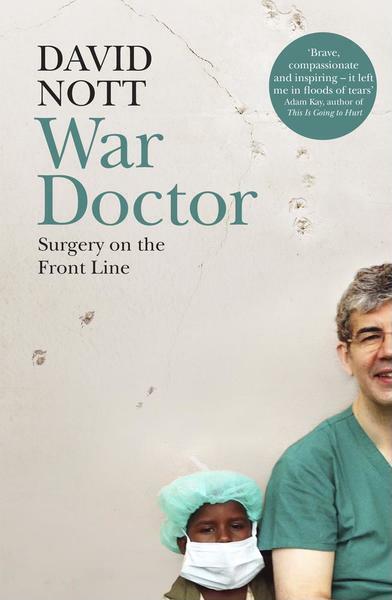 And the David Nott Foundation Facebook page is here. 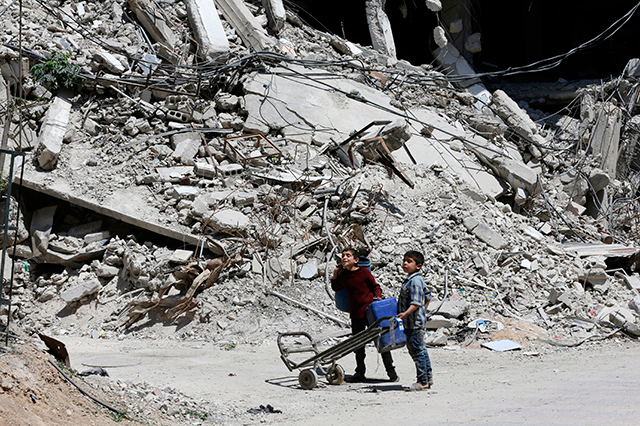 At least one chemical attack did take place in Douma on April 7 , and people died as a result. There could have been no other culprit but a Syrian army helicopter. But the way it happened bears little resemblance to what was broadcast to the world. From the start, the evidence presented by rebel media activists was fraught and confusing. That’s hardly surprising, because some of those behind it — including some who produced immediate and detailed reports — weren’t actually there. Into the gaps of that initial propaganda barrage seeped skepticism, which morphed into confusion and outright conspiracy-theorizing. State actors, Russian propagandists, and international observers joined the fray, cherry-picking details to illustrate the story they wanted told. Added to the fog of war, in other words, was a fractious new layer of electronic propaganda that turned every tweet or screengrab into a potential weapon in the hands of one of the belligerents. 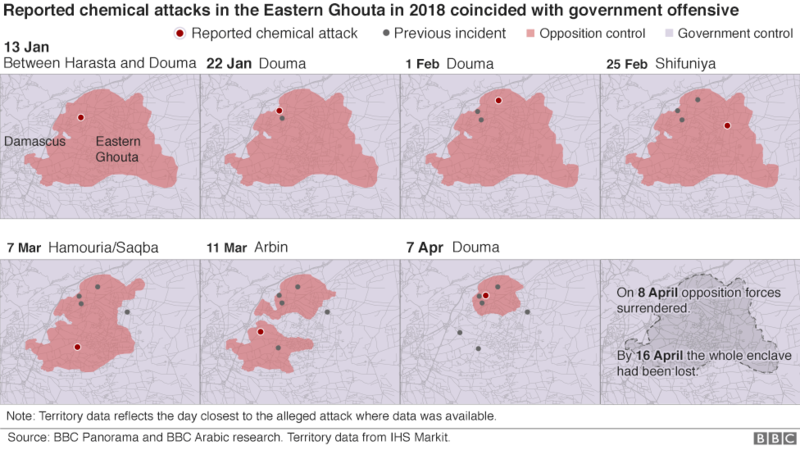 Beyond the war in Syria, the cloud of misinformation that enveloped the attack in Douma stands as a cautionary tale. In the era of “fake news,” it is a case study in the choreography of our new propaganda wars. With the mainstream media in wholesale retreat — and, in the case of Syria, credibly threatened with death from many sides — new information actors have stepped into the breach. Reading the runes of their imagery is an exciting reporting tool. But their photos, video, and social media posts also offers a vanishingly narrow, excoriatingly subjective view of how conflicts unfold. As a result, such artifacts have become light weapons in an information war that easily becomes an end in itself. He then provides an intricate choreography of his own visit to Douma on 9 July 2018, three days after the Organisation for the Prohibition of Chemical Weapons (OPCW) published its interim report on the attack (see also here). 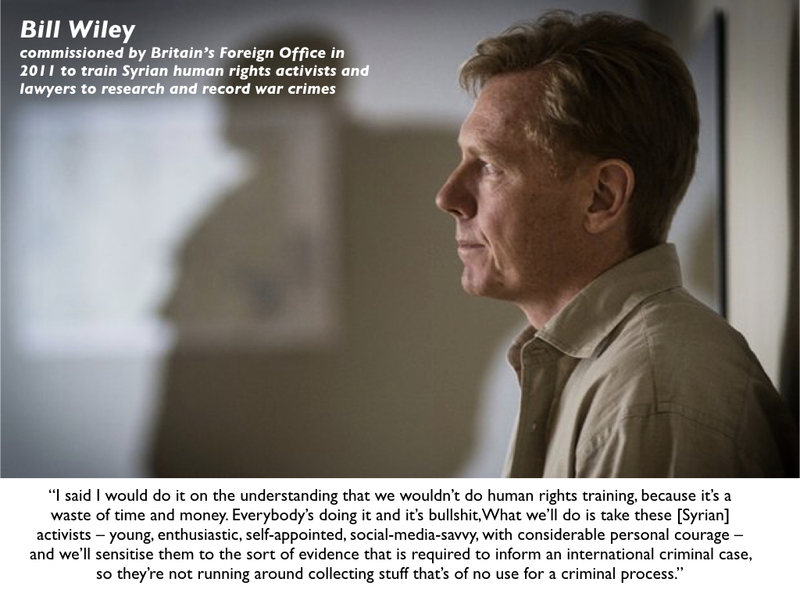 James was accompanied by officials from the Syrian Information Ministry – and he’s clearly aware of the limitations this imposed on what he saw and what he heard from those who remained in Douma after the forced evacuations – and interlaces his observations and interviews with the digital evidence examined by Forensic Architecture and bellingcat that I discussed in my original essay. 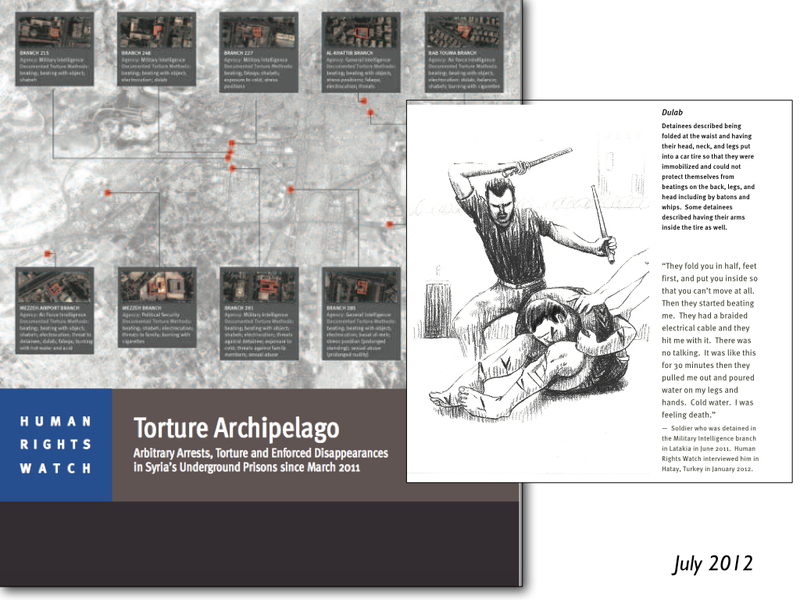 And second, the deliberate disinformation campaigns launched by Russia and Syria, revolving around multiple and demonstrably false narratives of ‘staging’ (again, the details are in my original essay here) and their circulation by witting or unwitting commentator-journalists. This matters because (as is the case with other, ongoing investigations that have exposed systematic falsehoods on the grand, one might say presidential scale) the core question is surely: why lie if you have nothing to hide? For all that, James’s investigation adds significant layers to our understanding of what happened on that awful April night. He’d seen such staging himself, the former OPCW official confided. In an infamous attack on an aid convoy on the outskirts of Aleppo in September 2016, which killed 14 civilians, he concluded that pieces of alleged photographic evidence had very likely been introduced or faked. 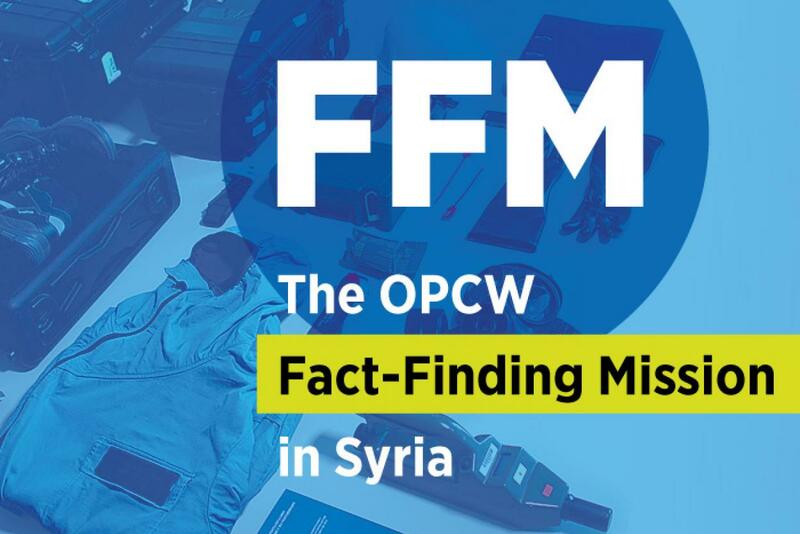 In addition, he maintained, “some opposition witnesses had clearly been coached.” Ultimately, it didn’t matter, the official said; six months later the United Nations had rightly declared the Syrian government responsible. It was just “media ops,” he said; the activists had simply been concerned to get their narrative out as quickly and forcefully as they could. [He] concurred with the analysis of internet investigators like Eliot Higgins [at bellingcat], with whom he often ferociously disagrees. The canister, he reckoned, would have weighed around 250 pounds and carried about 120 kilos of chorine. But it landed in an entirely unexpected way. Since the concrete-and-steel-mesh roof wasn’t very strong, the bomb punched a hole in the ceiling. The effect was as if the nose of the canister had been deliberately rammed into the external wall, so as to point gas directly into the room below, creating a gas chamber. That room would have filled with chlorine in one or two minutes. 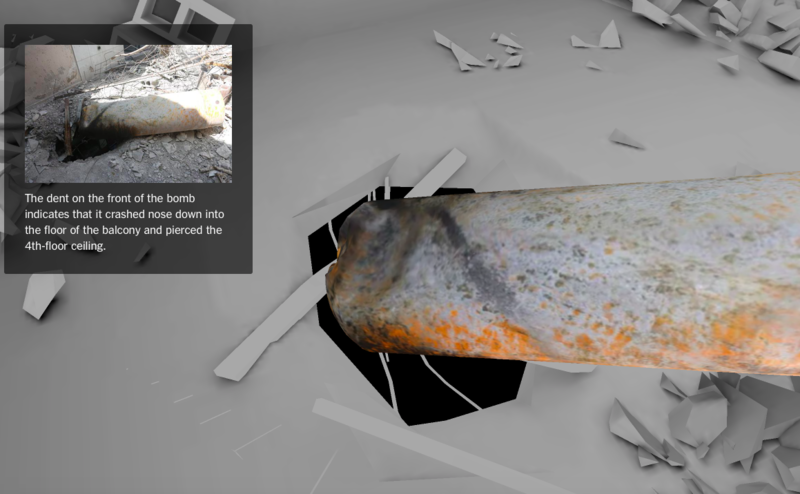 Drawing on Forensic Architecture’s modeling of the building onto which it fell, Postol estimated that the chlorine gas would have poured out into the upper floor at a magnitude several hundred times higher than a lethal dose, its density much greater because the release occurred in an enclosed space. As it made its way down into the two floors below, its density would have decreased, but still would have been much more than enough for a lethal dose. When it filled the building, the chlorine would have spilled out via open windows and doors and then drifted along the street, like a thick fog, at much lower concentrations. As it sank through the building, the residents hunkered down in the basement would have smelled it too. Many likely ran headfirst onto the street, only to be confronted by a chlorine gas cloud forming all around them. Instinct and training likely kicked in; since chlorine is thicker than air, the instructions they’d been given would have been to head for the roof. Under most circumstances, this would have been excellent advice, like the injunction to workers at the World Trade Center on 9/11 to stay put at their desks, but in this case, it failed the residents of Douma. As they ran back upward through the building, they’d have been rendered unconscious very quickly and dead within minutes. Delivered at that kind of dosage — thousands of milligrams per cubic meter — chlorine could easily have caused the frothing at the mouth, skin burns, and damaged corneas observed by medical workers, as well as the horrible smell and breathing difficulties of which residents complained. It also makes sense of what the motorbike rider had told me: that the whole street had been affected by the foul odor. To panic and terrorize the population was, after all, what this was for. The murderous result, concluded Postol, was “a very peculiar set of circumstances” and a terrible twist of fate. If the building had had been larger with a firmer roof, the balcony canister would probably not have fallen through; even if it had broken open and begun dispersing its payload, the chlorine would have wafted off into the open air and likely not injured anyone. If the roof had been even weaker and the canister had fallen right through onto the third floor, its valve might not have opened at all, like the one on the bed. But because of the way the canister punctured the concrete, its valve snapped so as to spew the contents directly into the enclosed space below. 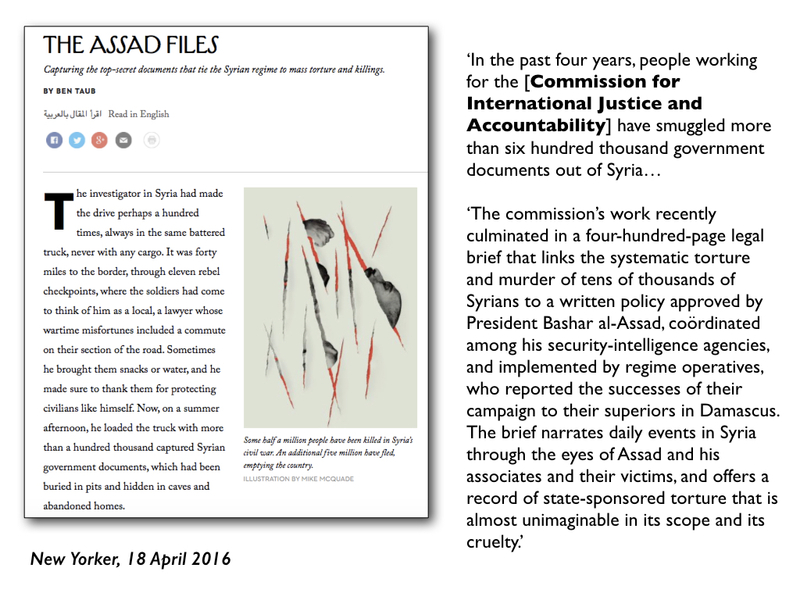 A lot of stars would have had to align for something like this to happen, just as the former OPCW inspector had said. But in this case, they did. And James ends with a sobering counter-factual. 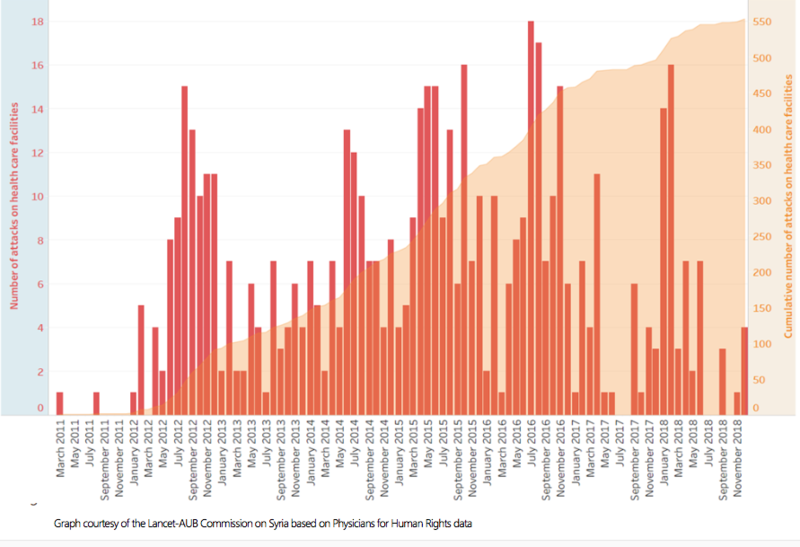 Throughout my analysis of siege warfare in Syria, I have criticised the selectivity of public concern (where there has been any at all), and in particular the outrage over chemical weapons compared with the insouciant disregard for other, no less murderous forms of military and paramilitary violence. (I admit this has become an obsession: hence my dismay at the political and critical energy directed against drone strikes in the world’s borderlands to the exclusion of other forms of aerial violence that have killed and maimed many, many more people). 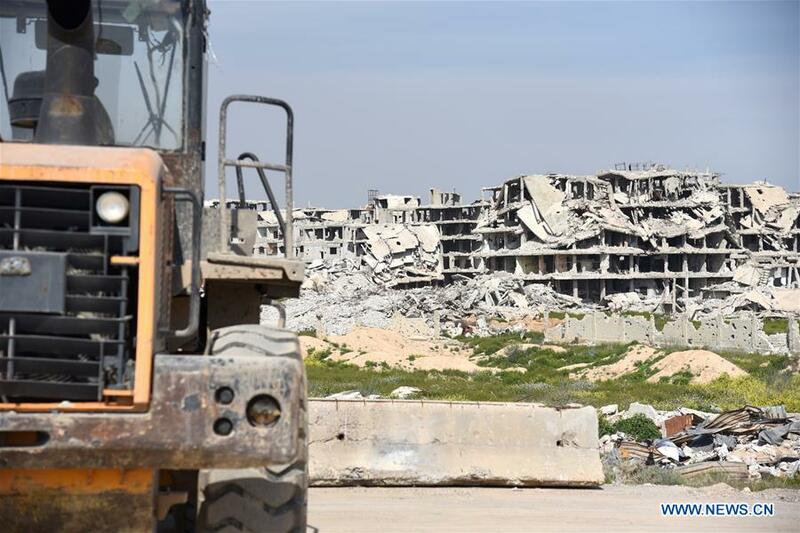 If a 500-pound bomb had collided with the roof of that apartment block near al-Shuhada Square instead of a chlorine canister, it would have punched clean through and landed slap on one of the higher floors. There would have been a tiny delay, only a fraction of a second, while the fuse sensed that it had reached its destination, after which the building would have blown apart and its entire weight fallen downward onto the basement. Everyone hiding there would likely have been buried alive. Whose voices would have been raised against that? A fascinating essay in the weekend’s New York Times from William Davies at Goldsmith’s, ‘Everything is war and nothing is true‘. 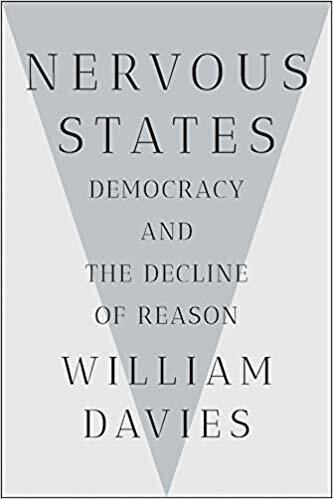 It’s a remarkably wide-ranging essay, travelling from Brexit through ‘post-truth’ regimes to martial politics, and it’s derived from his new book, published in the UK at the end of last year as Nervous states: how feeling took over the world (Jonathan Cape/Penguin) and about to be published in North America as Nervous states: democracy and the decline of reason (W.W. Norton). 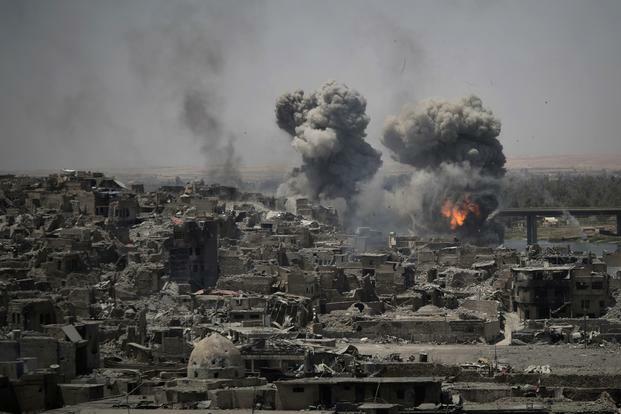 The principle that military and civilian operations should remain separate has been a cornerstone of liberal politics since religious and civil wars tore through Europe in the mid-17th century. The modern division between the army and civil policing originates in late-17th-century England, when early forms of public administration came to treat (and finance) the two independently of each other. Since then, the rule of law has been distinguished from rule by force. However, there is an opposing vision of the modern state that also has a long history. According to this alternative ideal, the division between civil government and the military is a pacifist’s conceit that needs overcoming. And it’s not a coincidence that these days nationalists are especially keen to employ the rhetoric of warfare: The wars that fuel the nationalist imagination are not simply military affairs, going on far away between professional soldiers, but also mass mobilizations of politicians, civilians and infrastructure. Ever since the Napoleonic Wars witnessed conscription and the strategic mobilization of the economy, nationalists have looked to war to generate national solidarity and a sense of purpose. There is another distinctive characteristic of military situations that civilian life often lacks: the promise of an instant response, without the delays that go with democratic argument or expert analysis. Warfare requires knowledge, of course, just not of the same variety that we are familiar with in times of peace. In civil society, the facts provided by economists, statisticians, reporters and academic scientists have a peace-building quality to the extent that they provide a common reality that can be agreed upon. The ideal of independent expertise, which cannot be swayed by money or power, has been crucial in allowing political opponents to nevertheless agree on certain basic features of reality. Facts remove questions of truth from the domain of politics. 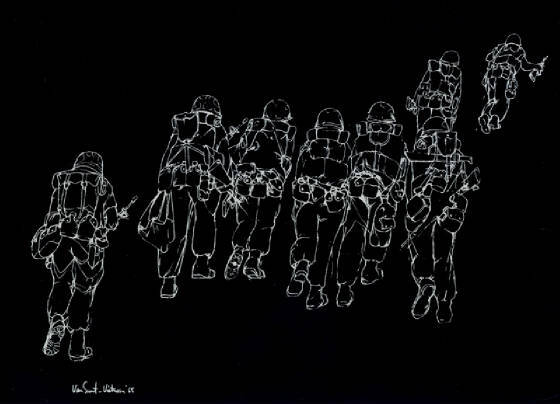 War demands a different, more paranoid system of expertise and knowledge, which looks at the world as an uncertain and hostile place, where nothing is fixed. In situations of conflict, the most valuable attribute of knowledge is not that it generates public consensus but that it is up to the minute and aids rapid decision making. Meanwhile, the information shared with the public must be tailored to incite mass enthusiasm and animosity rather than objectivity. 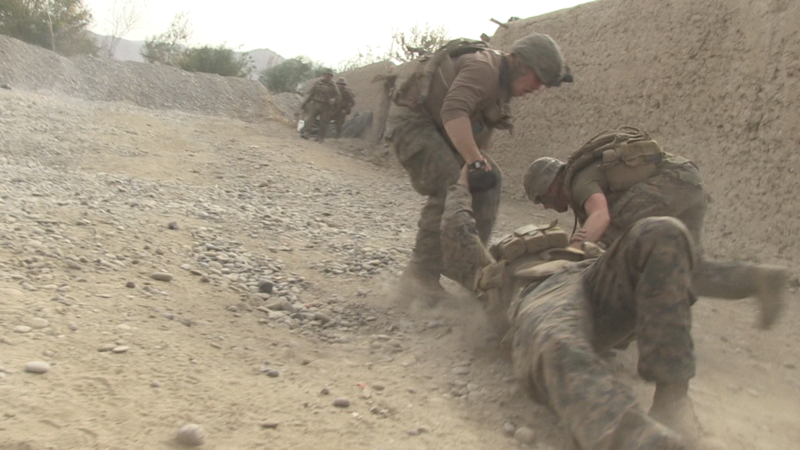 The conditions that most lend themselves to military responses are those in which time is running out. Of course, many of the emergencies that we face today are fictions: the “emergency” at the Mexican border or, perhaps, the British government’s intentional exaggerations of the threat of a “no deal” Brexit to put pressure on Parliament. Framing an issue as an emergency where time is of the essence is a means of bypassing the much slower civilian world of deliberation and facts. 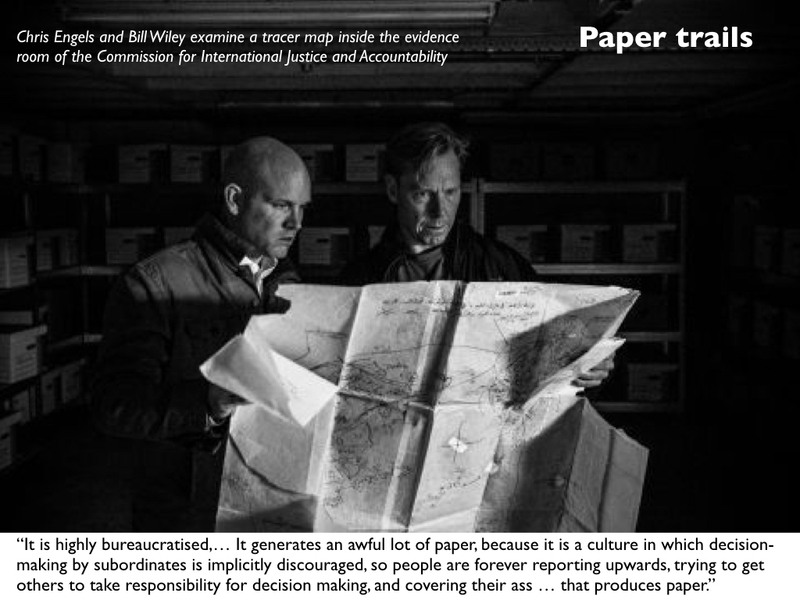 There’s much to think about here, though my immediate reaction is to suggest that much of what has come to be described as a ‘post-truth’ regime is in fact about establishing a post-trust regime: setting a thousand hares running across a hyper-accelerated public sphere so that it becomes exceptionally difficult to reach a common consensus – hence evidence yields to emotion. I’ve been thinking about this in relation to the disinformation campaigns that have bedevilled the war in Syria (see, for example, here), and working on a more general formulation of the argument, and I’ll try to return to this in detail in a later post.